RoyalEnfields.com: What's a fair price for a Royal Enfield? What's a fair price for a Royal Enfield? 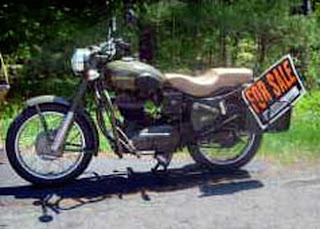 Alex asks, "what is a fair price for a used Royal Enfield Bullet motorcycle?" You can learn something by looking at the ads for used Royal Enfields on this blog. Of course, what you are seeing are the asking prices. Most buyers expect to pay less than that, and most sellers expect to get less than they ask. Some, in fact, may try to signal a willingness to bargain by tacking on an odd amount. Do they really want $4,250, or is that $50 just there for starters? Maybe the whole $250 is just to get things started. It never hurts to ask. Asking prices are high for one reason and one reason alone: the seller can drop his price, but he never gets a chance to raise it. He has to start high. The exceptions to this are, of course, dealers, who are expected to tack on taxes, destination, handling and prep charges and frequently do. That's why dealers may start the bargaining at an artificially low price. Don't be surprised if a private seller refuses to come down. You have to remember that an awful lot of Royal Enfields are sold with almost no mileage on them. The owners didn't get what they expected. Probably they thought a Bullet would be faster or flashier. They sunk a lot of money into options (almost everybody improves the exhaust, fits a new seat and changes the tail lights) and now they want to get the full cost of those back. You can't blame them for trying. After all, their bikes really are "better than new." Since ads on CraigsList are free, sellers can advertise for months and never drop the price. Some of the bikes on this blog have been here for a long time. The owners are just going to hang on until they really need the money. But buyers have an advantage, too, when responding to CraigsList ads. Except for this blog, most CraigsList ads aren't seen much outside the local area. Royal Enfields are still pretty rare and special. Not that many people are out there shopping in any single city. So, except for scam spam, CraigsList advertisers aren't getting a lot of email responses. They probably won't let a live prospect get away. If I were buying, and I saw something I wanted that seemed to be languishing, I might respond to the ad politely and say something like "gee, great bike, but I just can't afford it. I only have $1,000 cash. I really am sincere, I'm not trying to low-ball you, I know your bike is worth more for the right person. Please hang onto my email address and contact me if that person doesn't come along. Best of luck on the sale." Eventually there will be more Royal Enfields in the U.S. and the oldest of them will be older and have more miles on the clock. Then prices will drop some. In the meantime, keep in mind that what you see on the market may in fact be worth the asking price. They're all newish, mostly low mileage, loaded with options, haven't been "repaired" past the point where they can be fixed and the seller hasn't had 40 years to lose the title.